The decision comes as a blow to environmentalists and Indigenous groups opposing the controversial projects. U.S. President Donald Trump signed executive orders Tuesday to revive the controversial Dakota Access and Keystone XL pipelines. Trump’s signature has left Indigenous groups and environmentalists fuming but determined to carry on their struggle against the projects, which critics say will destroy local ecosystems and damage Native American sacred sites while locking the United States into a future dominated by fossil fuels. The move is seen as a stark example of Trump’s unequivocal support of the oil industry as he aims to boost the U.S. economy and the job market by restoring dirty industries and backing protectionism for U.S. manufacturing. Since April 2016, protesters started occupying camps in opposition to the 1,172-mile Dakota Access Pipeline. In December, the U.S. Army Corps of Engineers ordered to halt the construction of the project close to the reservation of the Standing Rock Sioux Tribe. Last week, the tribe ruled that demonstrators have until Feb. 19 to leave the occupying camps. After a lengthy campaign from environmentalists against the Keystone XL, which was set to transport oil from Canada to the U.S. Gulf Coast, the project was rejected by former-President Barack Obama in 2015. Environmental groups have signaled that Trump’s move will be met with renewed resistance. “Both the Keystone XL and Dakota Access Pipelines will never be completed, no matter what President Trump and his oil-soaked cabinet try to do,” said David Turnbull, campaigns director at Oil Change International. 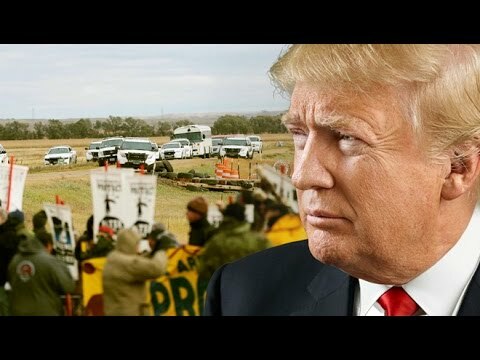 “A powerful alliance of Indigenous communities, ranchers, farmers, and climate activists stopped the Keystone and the Dakota Access pipelines the first time around, and the same alliances will come together to stop them again if Trump tries to raise them from the dead,” said Greenpeace Executive Director Annie Leonard. “Trump’s decision to give the go-ahead for the Dakota Access Pipeline is a slap in the face to Native Americans and a blatant disregard for the rights to their land,” said Jamil Dakwar, director of the ACLU’s Human Rights Program. The Standing Rock Sioux Tribe has not yet made a statement on the president’s order. While Trump has boasted that the pipelines will boost jobs, others are skeptical and believe that the numbers of positions will be well below what Trump claimed. On Tuesday, Trump also signed an action to fast-track environmental reviews and approvals of infrastructure projects. Since being inaugurated as president on Friday and being the catalyst of worldwide women led protests Saturday, Trump has already used executive powers to scrap the Trans-Pacific Partnership free trade deal and to ban U.S.-funded organizations around the world from providing abortion services, and even discussing abortion with clients.